There was now more media pressure than ever. I was trying to make it as a player and as the first black man on the Red Sox. I had no roommate. It never crossed my mind to have a roommate, since I was the only black on the team. It wasn’t a rule. It wasn’t a law. But it was unwritten that blacks did not room with whites. The Red Sox got me a room in a hotel. I didn’t even know if I had to pay for it or not. I got to meet Mr. Yawkey the second day that I was in Boston. He was a very gentle, short, round man. He told me why he called me up, said he wanted to get to know me, and wished me well. “If you run into any problems or need any advice on something, you don’t have to go to the coaches or manager. Come directly to me,” he said. I thanked him, and we shook hands. The first night I got to Fenway there was such a crowd, the park was full. A lot of blacks wanted to come to the game. They didn’t have a seat, but they were accommodated. The Red Sox roped off a corner part of centerfield. The whole thing made me feel special, but it made my blood pressure go up, too. “I can’t fail. I can’t make a mistake.” That was how I felt. When I first got to Boston, I got in touch with guys from the University of San Francisco — Bill Russell and KC Jones, who were stars on the Boston Celtics. Russ would take me around and talk to me. He told me where I should and shouldn’t go. There were overtones of racial things. These overtones could be heard not only at Fenway but at any other ballpark. Sometimes terrible things would be yelled out, racial epithets. Some people said I must have felt like killing somebody. But I never did. I got where I could divorce it from my mind, cut it off. I told people I had enough troubles trying to hit the curveball. I wasn’t going to worry about some loudmouths. In 1967 postxdbgpa i drink up NO clue.... | Michael Kors 2012 i i am a Junior one of many Scappoose increased traditional in the midst of ' am within the time period of time a negative a few of of class Michael Kors 2012. The home loans seem to be important for people, which want to organize their own career. In fact, it is very comfortable to receive a financial loan. 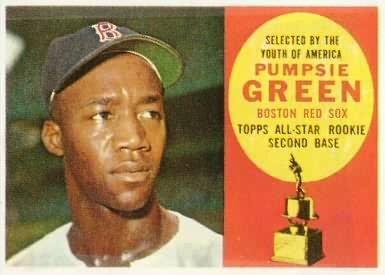 Pumpsie was the best black guy who played baseball. Anyway, I have always felt that blogging has been an art where people express their experiences in the best way. "It is no use doing what you like; you have got to like what you do." In cruising through the cards, I spotted the one of Willie Mays, who played for the Birmingham Black Barons before going into the majors. He was one of our favorite players since he was a local guy and was such a great player. I remember as kid about getting excited just to find out that Mays was playing golf on our neighborhood golf course.